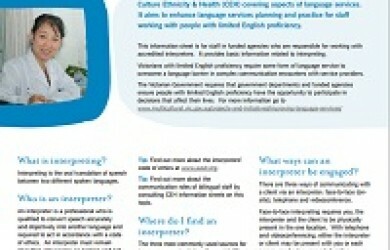 NSW Refugee Health Service has developed a free online tool which produces an appointment letter in 17 languages. It is simple to use and fast, enabling the letter to be printed off during a consultation and given to patients before they leave your ward or clinic. The Australian Medical Association Victoria’s website has a GP search which includes a language spoken field, very useful for locating billingual GPs.